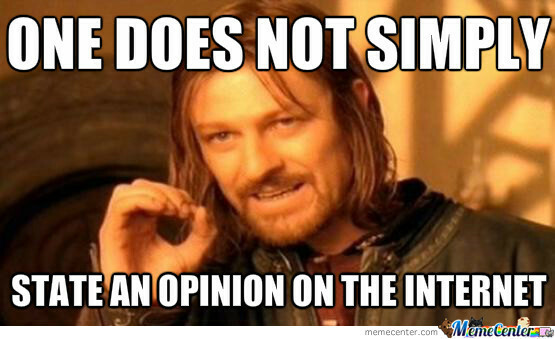 theGreatPatzer: ONE DOES NOT simply state an opinion on the Internet! ONE DOES NOT simply state an opinion on the Internet! Note that I said, watching or rather reading and not so much participating. You might wonder at that. But I’ve come to the rather principled view that its much better “to remain silent”, rather than have “anything you say or do can (will) be used against you in a court of [public opinion]” over at chess.com. Instead, despite the fact that those same people Could certainly can come to this blogosphere and flame away- I take comfort to know that so far the GreatPatzer readership has been VERY courteous and helpful. Both to me and other participants. Anyways, I wanted to depart from my normal litany of WHY-PATZERS-LIKE-MYSELF-ARE-REALLY-LOUSY-AT-CHESS. ( I imagine, however true that it is – this it must be getting old to read week after week)…. Note that I haven’t exactly been following this epic thread. But it is epic in the sense that it SO dramatically highlights the fight. WEAKer PLAYERS have the RIGHT TO SPEAK UP (THINK and OPINIONATE); and STRONGer players SHOULD BE RESPECTED FOR THEIR KNOWLEDGE, SKILLS and ACCOMPLISHMENTS. In the end. Both are truths and absolutes. When people seek to undermine either principle- chaos is guaranteed. Egos will be engaged. Folks feeling WRONGED with escalate with WORDS and STRONG EMOTION. I Also fundamentally think that Just like you can’t play strong chess mad (emotions dramatically color your objective judgement of the position), good tips and useful instruction diminish in an angry rude thread. There’s a “this thought occurs to me and might help you” VIBE that needs to occur if a random stranger is to depart any useful information to another random stranger. WHY SHOULD WEAKER PLAYERS have the right to speak up, think and opionate? So here’s one good thought. If the point is for a chess forum to be a teaching tool- a place where players learn from another- why should a weak player say anything? I can think of three good reasons…. FIRST the World Champion can’t spend his whole time Teaching all the world chess! Chess Strength IS relative. What is good to one person is a perfect patzer to another. While we can say in general terms whether we are good or not- this greatly depends on who we’re comparing ourselves to. IN FACT, in most cases compared to the GENERAL populations of people that have played the game- EVEN some of the Weakest tournament players are PATZER TYRO’s. and demolish those that had only a superficial, fleeting experiences at chess. You’d be surprised on how far PATIENCE, and a little EXPERIENCE get you against those that have little of either. SECOND, We all think a little Differently! Insight at chess can occur to anyone who is thinking deeply at chess. The most powerful ideas in chess (well at anything) are simple ones. little ideas that affect every move can literally revolutionize your game. most of the time these “little ideas” catch – not so much because they are hard to figure out, but because with experience finally we are prepared to understand them- to internalize them. Its Equally True- that just as good as to HEAR something that gives us deep insight- there is the possibility that I will finally SAY something that revolutionizes my chess. In FACT, this is one of the reasons I relentless toil away with my Blog. BY BLOG is the chance to share my thoughts, to clarify my thinking, and hopefully to reduce some of my most discouraging weaknesses. THIRD, Writing about chess allows one the opportunity to become passionate about their chess. Staying interested in one hobby for likely years at a time is NO easy task. ADD to this the need for time consuming, and Draining mental exercise – a bunch of it, done quietly with no one but yourself; IS daunting. Let me be clear- I am by nature a introverted person- but when there seems no support group- its tough to slog on. I think a good “Club player” has a significant advantage in this respect. But the unpopularity of this hobby and the geographical smallness of this corner of PA makes connecting to other people impractical. So, lets just say that I really value my blog readers- I picture them as a group of fellow supportive chess players. [WOW! This is a really LONG BLOG ENTRY!] sorry. I’ll try to keep the rest of it short. WHY SHOULD STRONGER PLAYERS have respect? Let me keep my comments Brief here. FACE IT! you can have whatever opinion you want. It is those that have played and WON that have proved their KNOWLEDGE of chess. It is particularly crazy for some mid-club newby to contradict a TITLED player. Seeing as How a Titled Player had to face and prove his understanding of key ideas and variations against strong, slow and determined opposition. Another Brief, Point to make. You should be glad that someone high-rated has even bothered to discuss you own limited understanding of openings, the middlegame and chess. There is little for them to gain and they certainly don’t need to your acclaim. The key problem for YOU is that LIKELY- you don’t understand enough chess to know how much more they COULD teach you. Your not prepared to hear it. Instead, without the pivitol battles and rigourous training; you think you know it all- as if chess were nothing more than avoiding blunders and memorizing a few lines. The DUNNING KRUGAR Effect. Instead really seek to MASTER THE GAME and then perhaps you won’t BE so inclined to INSULT what a HIGH RATED MASTER might choose to tell you. I like reading your blog :). Even if I am not a titled player, but most often I can think over your thoughts and try to catch your intentions! I have participated at chess forums for about 10 years. Nowadays I simply try to read and observe what others are thinking and sharing. And you are right - both parties should learn and support each other. What strikes my the most when I try to discuss chess things with others? There are some features, but the most important are: lack of respect, (too) big ego, lack of understanding the intention, lack of making conclusions and being able to prove his point. When I share my thoughts with others - I need some kind of "solid science" - especially if its intention is to help me in my (chess) development. Thanks a lot for another thought-provoking post! :). Well done Jason!